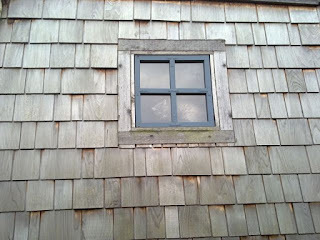 Over a year ago, I built a window shelf under the large front window on the enclosed front porch. In the warmer months, Max would frequently be found sprawled out on the shelf, enjoying the view of his front yard. He seemed to enjoy being higher up and having a broader view of the front yard. Of course the birds in the rhododendron kept his attention. 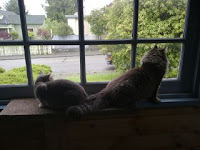 Willow and Nahum have been enjoying this view and Willow also uses the shelf to get better access to bugs. Occasionally, there is a kitty traffic jam - one cat tries to leave while the other obstructs the exit. This problem is currently being reviewed for possible solutions. Since the one shelf gets cramped with two cats, I figured with the addition of the new cat, we needed more window shelves! So, after a little measuring and cutting we now have two additional kitty viewing platforms. The new ones are on the back enclosed porch, under the back and side windows. Judging from the amount of use these new shelves are getting, they were definitely necessary home improvements! Next up may be a shelf widening project. Theo needed to shop for a new harness for class - kind of like the kid needing a new backpack for school even though last years is still quite serviceable. My AAT instructor informed me that the harness I was using was not appropriate for animal therapy work and needed to be replaced by one that doesn't adjust with the cat's level of movement. 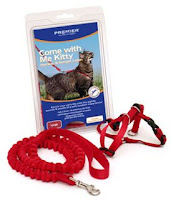 I had been using a Come With Me Kitty Harness by Premier (which is the cat equivalent of the Gentle Leader dog harness.) The nice thing about this harness was the shoulder straps tighten and loosen as the cat moves around without putting pressure on the throat. 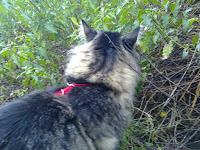 On a traditional harness the strap around the head can press against the throat if the cat jerks fast. So we head over to Pet Pros, our local pet store chain, where I buy the cat gear. 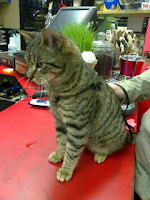 I like the smaller store, it tends to be a less crazy atmosphere which is more cat friendly. The woman working the store was very gracious and allowed us to try on each of the harness options for Theo. The harness needed to fit well and be stylish. We eventually settled on a basic black step-in. Theo was like a kid in a toy store! He checked out a bunch of toys but finally settled on the Kong Kickeroo, which now lives in the middle of our living room! I realized after the Pet Partners class, that one of the lessons I learned came not from the information being presented but from the experience. When I take my therapy cat to work, I need to learn to split my attention three-ways instead of the usual two. I will need to be attune to the client's condition and needs, the cat's condition and needs, and my own condition and needs. That is going to take a lot of practice! Christi, the instructor suggested I take Theo out to public places and walk him in front of stores where people are coming and going. That way he gets exposure to unknown people wanting to touch him and unusual sounds and smells all in unfamiliar setting. It would also give me the chance to develop my attuning skills in a less intense environment than in my work. Even though two thirds of my biggest fear came true, I am on the other side of the first day of class feeling like it was a big success. My biggest fear - Nahum freaking out, me feeling horrible about his stress and then feeling overwhelmed by shame for being exposed as a terrible pet owner - only partially came true. Yes, Nahum freaked out from being overly stressed and yes, I felt like a horrible pet owner for putting him through that torture, but I never went to the shame place. I don't really know why I didn't feel the shame as I was sitting up by the instructor, practically in front of the whole class (an attempt to add more distance between the dogs and Nahum). Perhaps it was because my attention was split between trying to comfort Nahum and listening to the instructor leaving no brain cells for the shame to use. Maybe it was the presence of a room full of potential therapy animals. Or, perhaps it was the payoff of years of working on being more self-compassionate. Regardless of why, I am very thankful that shame did not visit. My concern for Nahum's comfort certainly overshadowed most of my headspace and I wasn't able to fully enter into the excitement of the moment. But, overall I feel the class was fun and I am very much looking forward to more. 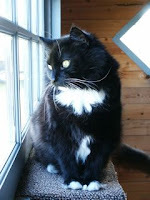 I anticipate the next class to be much more easygoing and enjoyable as Nahum will be home playing with his favorite string or snoozing in one of his many favorite spots and Theo will get lots of laptime in a room full of dogs and unfamiliar people. This morning I moved closer to accomplishing a dream. Wow, it is not every day that I can say that! Before I get into that, let me backup and start with Sunday. On the eve of the first day of class, my anxiety was mounting due to my inability to decide who to bring to class, Nahum or Theo. So, I consulted with a previous graduate and my anxiety quickly calmed. (Thank you Lisa!) She suggested I not choose either-or but to bring both, which is what I did. Nahum was my starting cat and Theo was second string. The class consisted of five dogs and my cat. Nahum was stressed. The combination of the two super-huge-giant dogs, three medium sized dogs and the unfamiliar space caused him a great deal of anxiety. About midway through the class Nahum was quite happy to turn things over to the backup cat. Theo wasn't phased by the enormity of the two canine beasts nor the new space. He took it all in stride, spending his class time sprawled in my lap purring and occasionally meowing when he wanted the stalled petting hand to stop resting and resume petting. On the ride home Nahum clearly communicated his displeasure with the whole experience and I realized then that he is not ready for such a class. As I am not a proponent of torture of animals, I can not willfully do something that creates that much stress on my Nahum. I don't know if he will ever be comfortable enough for such an endeavor but that's okay. I love him for his delightful way of being and his deliciously soft fur. So, congratulations to Theo - he gets promoted to first string and Nahum gets to forgo the working life awhile longer. Max loved his yardtime. 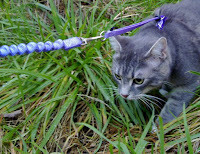 When he heard the jingle of the harness and leash he would come running - he knew that soon he would be out in his yard, sniffing and rolling in the grasslike the big tough outside kitties. He never tired of taking excursions into the wild. Today was Nahum's and Willow's first excursion in the yard. Nahum got first shift - he was a little put off by the harness and leash at first, but soon the adventure consumed his focus. He sniffed in motion and thus covered a lot of ground. When it came time for his turn to end, he firmly protested. Willow watched longingly through the window while Nahum explored. When at last it was her turn, she was scared at first, but after some time under the large planter her curiosity took over and she was off. She very meticulously explored her new world. I was struck by how naturally and beautifully Willow interacted with the wild. 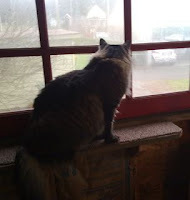 For the remainder of the day, Nahum was glued to the windows, gazing out at his newly discovered yard. It seemed that he desired more than anything to take another romp around the yard. If the dry weather holds, he may get another opportunity tomorrow. For me, this yardtime was a mix of fun and sadness. It was a delight to see Nahum and Willow so alert and engaged as they experienced the big outdoors. A feeling of sadness and loss also stirred in my heart, as I remembered many of the wonderful yardtime memories that Max and I shared. Today was the first day of a 100% kitty integrated home. And so far everyone has been getting along rather well. Willow seems to have accepted that Theo is not going away. She continues to generally ignore him but for the most part she has stopped hissing and growling. There are still plenty of tense moments. Theo's favorite napping spot is on the ottoman in front of the fire. The problem is, that has always been Willow's favorite spot and whereas she will occasionally share her spot with Nahum, she has made it clear that she is not going to share with Theo! Meanwhile, Nahum and Theo continue to figure out how to play with each other. They are both tentative but continue to try. I just received my registration confirmation for the upcoming animal assisted therapy class. I excitedly showed Nahum but he didn't seem that interested. The class starts next Monday and as usual the anticipation of the first day of class stirs up all sorts of fears. This time it is a little different though, as I will not be going alone, I will have a feline partner. Nahum and I are a team, which means we both have to pass the tests to succeed. I feel somewhat confident in my abilities but Nahum's abilities are quite a bit more unknown. My greatest fear involves Nahum being too freaked out to be able to participate in the class activities. That would leave me feeling really horrible for subjecting him to such stress, and then a microsecond later I would be flooded with shame. Nahum's traumatic response would make it clear for everyone to see that I was a complete idiot for thinking such a fearful cat could possibly be a therapy animal candidate. I can't help but wonder what it would be like to anticipate the first day of school with more excitement and eagerness rather than fear. Do people really do that? Today is day 8 of an integrated kitty home. Theo now has the freedom to roam the house whenever a human is home. Apparently, we failed to communicate this new freedom to the other cats. At about 2:30am, Theo decided to exercise his new freedom and began to explore his territory. Meanwhile, Nahum was curious about the activity he was hearing upstairs and decided to check it out. They met on the stairs and gave each other a good scare which startled everyone awake! Willow remains curious about the newcomer and continues to occasionally hiss at him. Nahum has been very friendly with Theo, even cautiously inviting him to play. They are starting to trust each other more and Theo is certainly starting to feel more comfortable in his new space. One of my given roles in the household is to be the one who cares for the cat’s play needs. I have happily accepted this responsibility as playing with them brings me great joy. I also get the additional bonus of being associated with fun, which means I get greeted with a flurry of kitty excitement when I get home! As a child, I have many fond memories of playing with our Chihuahuas. When my parents were gone, I would often strip all the cushions from the couch and build elaborate forts out of blankets, cushions, pillows, furniture and whatever else was handy. We would play for hours and always had a blast. Now, I get to re-live those fun times. A simply constructed blanket-fort – a blanket strung over some furniture and the scratching post can provide hours of entertainment for all. One time Nahum and I were playing in the blanket-fort when out of nowhere Willow jumped from the couch right on top of the fort, collapsing it on top of us. Nahum and I were completely taken by surprise. I howled with laughter. Each of our cats has their favorite toys. Max had his blue yarn ball. Willow has her little rattly mice. Nahum has his bootlace string, which he carries with him everywhere, like a little boy carrying his favorite blanket. He also seems to think Willow is his toy to chase and gnaw on. Theo’s favorites have not been discovered yet. Play seems to come natural to our cats; it is an important part of their life. It is also an important part of my life. Sometimes when life is more balanced, play occurs naturally in my life (i.e. rehabilitating a lovely piece of yard art and returning it to it’s native habitat.) Then there are other times when I have to intentionally work at incorporating play into my life. Playing with the cats is certainly fun, but there is something different about play with fellow humans. Allowing myself to be childlike, to fully laugh and be silly is to allow myself to be vulnerable, to risk being mocked and shamed. In order for Nahum to play with abandon, he must feel safe in his home and with his people. When someone visits or I take him on the road, he is much more reserved. My hope is that I can someday play like Nahum, with amazing freedom from the constrains of being overly self-consciousness, trusting that God and my people will be delighted by my antics rather than freaked by my wildness. In preparation for Nahum's upcoming therapy animal training, I have been taking him on the road, trying to help him get accustomed to meeting people in unfamiliar places. Tonight I loaded Nahum and Theo into the car and headed to Seattle to visit a friend and her chocolate lab. Nahum was cautious and on edge but curious enough to sniff everything in the house. By the end he was sprawled on the soft cushy chair, watching the dog be a dog. Theo explored the house as if surveying a new part of his kingdom. By the end of the visit he was eating treats off the dog's paw and convincing his new human friend to carry him around on her back. Meanwhile, Nahum watched with mild interest. Theo did just as I expected while Nahum exceeded my expectations. I feared he might hide under the couch, sacred and anxious to return home. I hope with more positive exposure his comfort level will only increase. "Girls are sugar and spice and everything nice. Boys are snails, nails and puppy dog tails." I remember my mom playfully saying these words every so often when I was a young boy. As an adult now looking back, I don't think she really believed these seemingly cute little platitudes, and yet I kind of wonder if on some level I bought into them. I often refer to Willow as 'Sweet Willow' although lately she has demonstrated many very unsweet behaviors. 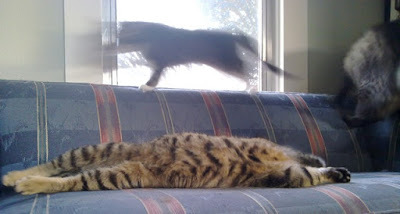 A few months ago she started playfully pouncing on Nahum with the frequent result of annoying and upsetting him. She frequently growls and hisses at Theo and even attempted to nip at him today. Even though this level of aggression appears somewhat new, she has never really been that affectionate, especially as compared to Nahum. Sure, Willow has her moments of sweetness, but by far Nahum's personality is much sweeter in nature. And yet I never refer to Nahum as 'Sweet Nahum'. I can't help but wonder if I am experiencing Willow through my boyhood 'girls are sweet' lens. Lately Willow has certainly provided lots of evidence against the original axiom being true. I also wonder how my relationship with Willow will change as I experience her more as she really is (both sweet and sour) versus my distorted yet familiar view. I have been dreaming for ages now about employing a cat in my counseling work. 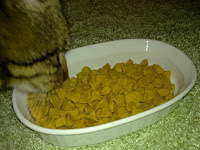 Max was affectionate and snugly but sometimes just a little too quick with the use of his teeth. Willow enjoys unknown people from a comfortable distance. Nahum's constant curiosity and playfulness, I hope will make him a good candidate for a therapy cat. Theo's easy going nature would also make him a possible candidate, but as he is still settling into his new home, he gets to enjoy the non-working life awhile longer. Nahum's therapy cat potential will be put to the test soon enough, as today I signed us up for a 7 week class which hopefully will lead to us becoming a certified animal assisted therapy team! For more information on the training, check out www.healingpaws.com. Theo has spent time on the street. We don't fully know his story, but when we found him he was foraging his own meals. Outdoor cats do this all the time without any problem, but Theo was a former inside kitty and from his constant interest in food, I am guessing his foraging skills were a little rusty - he was a very hungry kitty! After two weeks of regular generous feedings, Theo is always demanding more food. He is driving us all crazy with his non-stop begging. As soon as he gets his serving of nuggets, he inhales them and immediately begs for more. After eating about two thirds of the bowl of nuggets, Theo took a break. Our house is momentarily quiet. I am reminded of my good fortune and the great blessings I have received. All of my life I have never known hunger like Theo, I have never lived in fear of when my next meal would come. I am thankful. Today was day 2 of an integrated kitty home. We let Theo exist with the rest of us in the living space for most of the evening. He drove us all nuts with his seemingly non-stop meowing. Willow upgraded her expression of displeasure by hissing and swatting. She connected at least two times that I witnessed. Each time Theo promptly moved away and gave her a confused and emotionally hurt look. Poor guy, he just wants to be friends. Theo is curious and easy going - not at all a fighter. His way of being in the new space with new cats reminds me a lot of being the new kid at school or camp. He doesn't know the rules, what to do or how to be. He decides to play with one of the available toys and the cat whose toy it is quickly runs over to see who is messing with their stuff. It feels awkward and difficult. Seeing Theo's sad and confused face after Willow swatted him brought back all sorts of traumatic memories of awkwardly trying to meet new kids by being friendly only to get ridiculed or scorned in response. So, I did what I desperately wanted when that would happen to me, I snatched Theo up, held him close and gently explained what was going on. He sank deeply into my lap and watched the other cats play as I gently stroked his soft fur. Tomorrow we will try again, and maybe then Willow will show a little more of her sweet side.